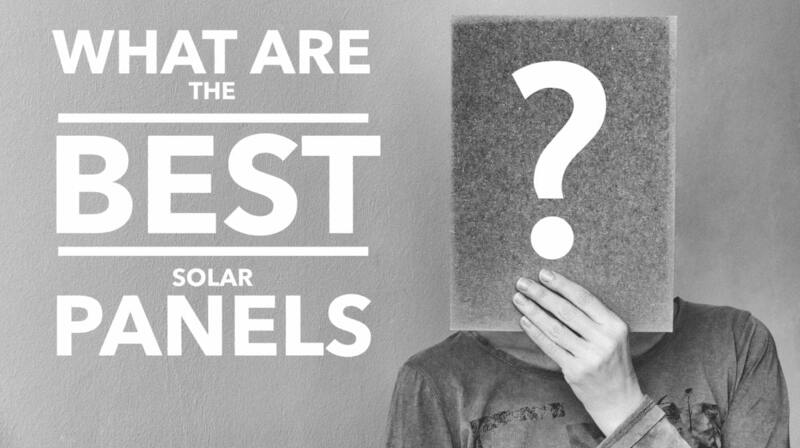 Q: What Are The Best Solar Panels? Our clients are faced with a wide variety of choices from the size of the panels (watts), to efficiency ratings, to the material they are made from (Monocrystalline, Polycrystalline or Thin Film), to their warranty, to where the solar panels are made. We only sell Monocrystalline silicon panels for residential installations because of their even coloring and uniform appearance. This high-purity silicon is made of single-crystal wafer cells cut from cylindrical crystal slabs. The deep blue color of the panels is because they are made from a single continuous ingot. While they cost more than other types of silicon, they are also the most efficient, producing more power per square foot than other types. We work with each of our clients to determine the best solar panels for their application. Many factors impact this decision including: your current energy usage, the amount of energy you want from solar, the size of your roof, the angle and pitch of your roof, the amount of irradiation your roof receives from the Sun. your warranty preferences, and your budget. Solar panel efficiency refers to how well solar panels can convert sunlight into electricity. A higher efficiency rating is better, because it means that your solar panel is able to convert more of the sunlight it captures into electricity. For example, LG 365 watt panels are 20.8% efficient, Panasonic 330 watt panels are 19.71% efficient, and Trina 300 watt panels are 18.3% efficient. Note: if you have plenty of roof space, you can use a few extra "less" efficient (and less expensive) panels to produce the same amount of energy at a much lower price. If you are "tight" on roof space, you may need to spring for a more efficient panel. The temperature coefficient tells you how well your solar panels will perform in less-than-ideal conditions. Solar panels operate most efficiently when they are kept cool (ideally around 25° C or 77° F). The temperature coefficient gives you a sense of how your panel’s performance will degrade during hot summer days. For every degree above 25° C (or 77° F), your solar panel’s electricity production will decrease by the temperature coefficient. A lower temperature coefficient is better. Higher end LG and Panasonic panels have temperature ratings of around -.3% / ° C, while Trina Panels are in the -.39% / ° C range. There are three main types of warranties provided by the solar panel manufacturer. Fully understanding these warranties is critical for having a long-term, low-stress solar energy system for your home. All of the panels that we install come with a 25 year production warranty guaranteeing that by the end of the term the solar panel will continue at a certain percent of original production. The workmanship warranty, also known as a materials or product warranty for the same panel is also important. The panels that we offer come with a 10, 12, 20 or 25 year workmanship warranty. The final warranty is a labor warranty. LG covers labor for 25 years on their pv solar panels. Bankability simply means that multiple lenders have demonstrated significant confidence in the quality of these panels and in the manufacturers which produce them, and that they will be around to honor any warranties and guarantees. Some panel manufacturers such as LG and Hanwha have taken out insurance policies that guarantee their warranties will be honored even if the firm cannot. We often hear the question "Are these solar panels Tier 1?" What people usually refer to is if they are on the Bloomberg Tier 1 List. Notably missing from the most current list is SunPower (due to continued financial concerns). It's important to remember that the cost of your solar panels typically represent between 18% and 30% of your fully installed solar system. That said, solar panel pricing can vary greatly between manufacturers. The chart below illustrates the % difference in the price per watt for JUST the solar panels. We use Trina as the baseline price (at 0%) because it's the cheapest, and illustrate the percent difference in price per watt between the other panels. Solar Panel Rating - Who makes the best solar panels? We currently offer PV solar panels from: Hanwha, Jinko, LG, Mission Solar (USA), Panasonic, Silfab, and Trina. Please see the chart below for a summary of each panel. We have rated each panel based on a combination of Efficiency, Temperature coefficient, Warranty, Bankability, and Price. NOTE: The cost of the solar panels is typically between 18% and 30% of the fully installed solar system price.